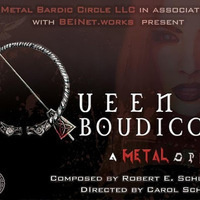 QUEEN BOUDICCA a Metal Opera is based on the real life Queen Boudicca of the Celtic Iceni tribe- perhaps the greatest freedom fighter in Celtic History. Rome’s cruel abuse of Boudicca and her daughters, unleashed a lioness the likes of which the Roman Empire had never seen! This is her story from loving Queen, wife, and mother….to savage destroyer of everyone and everything in her path. This radical reimagining of opera is composed by Berklee College of Music Professor, inventor of the Viotar, and native Rhode Islander; Bob Schlink. QUEEN BOUDICCA a Metal Opera marshals the forces of a Heavy Metal band, Chamber orchestra, ancient Celtic music, Twentieth Century music, and a Celtic drumline. Ancient instruments such as the Warrior’s Lyre, and war Carnyx, reproduced by Schlink, are also used to create an overwhelming surge that propels us all headlong to its tragic conclusion.